Since 1996, DAFA has funded a number of community-based development projects. Let us tell your briefly about 2 of these projects, namely St. Dominic’s Missionary Hospital and Yengwe Primary school. One of DAFA’s key priorities is to provide medical aid and support to the sick, and provide hospice care for the terminally ill. Located 18km from the nearest town, Ndola, St. Dominic’s Missionary hospital caters to a surrounding population of 35,000. Previously a small clinic built on the site of an old beer hall, St. Dominic’s has now achieved fully-functioning status and is one of the projects we at DAFA are most proud of. The 125-bed hospital facility offers standard health care procedures, surgical and outpatient facilities, AIDS and Tuberculosis laboratories, dentistry services, vaccinations and even a designated pharmacy. Since 2016, DAFA has funded the construction of significant residential facilities for the medical staff working at the hospital and St. Dominic's has treated 15,000 outpatients in the first three months of 2018. Please see below for an in-depth case study of this project. When we arrived in 1998, Yengwe was a school that consisted of 2 small buildings and catered to 50-60 students. Located just half a mile from St. Dominic’s Missionary Hospital, today Yengwe Primary School consists of 24 large classrooms, all funded by DAFA, that cater to 1,500 pupils in total. Thanks to our contribution, not only do the pupils have the opportunity to obtain an education, but they are also provided with lunch every single day. Why you might ask? The reality is that the majority of pupils do not get any breakfast and walk up to 8km each morning to get to Yengwe. The lunch meal DAFA provides consists of soya that is boiled into a soupy mixture – a true, nutritious ‘booster’ to help the pupils excel through the remainder of their school day. As with St. Dominic’s, DAFA has been tremendously lucky when working on the project of Yengwe Primary School. In 2013, Suffolk Country Council decided to amalgamate a number of schools in the UK; after making a request to the Council to obtain the school equipment, we were very generously granted permission to transport all school equipment from these closing schools to Zambia, via Walvis Bay in Nambia. Today, in schools all over Zambia, young people are using equipment previously used by young pupils in Suffolk – it is an uplifting thought. Offering routine checkups, surgical procedures, prescriptions, vaccinations and dentistry services on site. In the mid 1990s a small clinic was established on a site previously occupied by a beer hall outside of Ndola, Zambia; it was called Kavu Clinic. 20 years later there stands a fully staffed and resourced hospital: St. Dominic’s Missionary Hospital. The specialist medical equipment that the hospital required was sourced from the UK, using surplus equipment provided by the British Army returning from Afghanistan. St. Dominic’s Missionary Hospital was officially opened in 2016 by the president of Zambia and the Minister of Health. 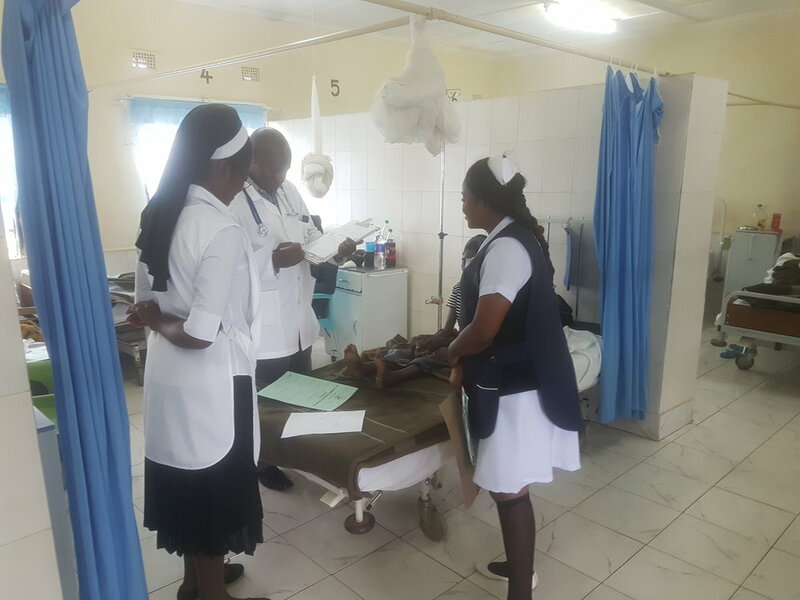 Given its remote location 18 km outside of Ndola – a challenge emerged: how to house the key medical staff? DAFA decided to build them appropriate accommodation so that all staff members could live in close proximity. The construction of this accommodation cost well over £1 million, a major investment that was funded entirely by DAFA. We are proud to say that as of 2017, the seventh residential building has been completed. DAFA also funds the ongoing costs that are required to keep St. Dominic’s Missionary hospital running effectively. In mid-2018, for example, we spent nearly £100,000 upgrading the pharmacy and mortuary facilities. ominic’s Missionary Hospital has now achieved fully- functioning status and caters to a surrounding population of 35,000. Most of these patients are underprivileged, unemployed and do not have any prospects of future permanent work. Setting up and supporting St. Dominic’s has been a key milestone for DAFA and we would like to thank everyone involved in this project.